Industrial machine vision camera interfaces have continued to develop allowing cameras to transfer megapixel images at extremely high frame rates. These advancements are opening up endless applications, however each interface has its own pro’s and con’s. Selecting the best digital camera interface can be done by taking in several considerations first and in doing so, can window down your selection. The following are some considerations in making an interface selection. Bandwidth: This is one of the biggest factors in selecting an interface as it essentially is the size of the pipe to allow data to flow. Bandwidth can be calculated by resolution x frame rate x bit depth. You essentially find out pixels / second x the frame bit depth resulting in your total Megabits / second (Mb/sec). Large frame sizes at high speeds will require a large data pipe! If not, you’ll be bandwidth limited, so one would need to reduce the frame rate and image size or a combination of both. 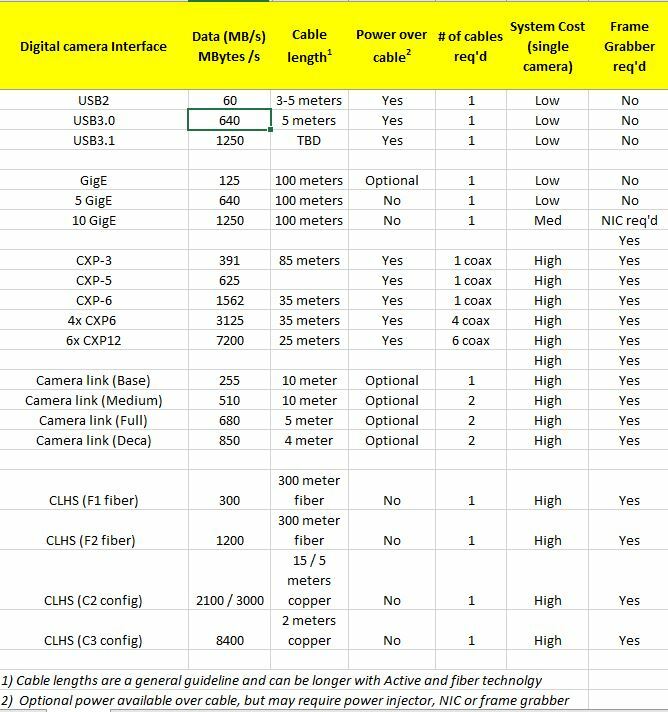 Cable Length: The application will dictate the distance between the camera and industrial computer. In factory automation applications, the cameras can be located in most cases within meters from the computer vs a stadium sports analytics application requiring 100’s of meters. Cost: Budgets dictate in most cases, so this must also be considered. Interfaces such as USB are very low cost versus a CoaxPress interface which will require a $2K frame grabber and more expensive cables. Complexity: Not all interfaces are plug and play and require more complex configuration. If you are leaning towards interfaces using frame grabbers and have no vision experience, you may want to elect using a certified systems integrator. Digital machine vision camera interfaces. USB2.0 is an older standard for machine vision cameras and now superseded by USB3.0 / 3.1 . Early on, this was popular allowing cameras to easily plug and play with standard USB ports. This is still a great option for lower frame rate applications and comes with low cost. Click here for USB2 cameras. GigE Vision was introduced in 2006 and is a widely accepted standard following GENICAM standards. This is a the most popular high bandwidth interface allowing plug and play capabilities and allowing long cable lengths. Power Over Ethernet (PoE) will allow 1 cable to be used for data and power making a simpler installation. GigE is still not was fast as USB3.0, but has benefits of 100 meter cable lengths. 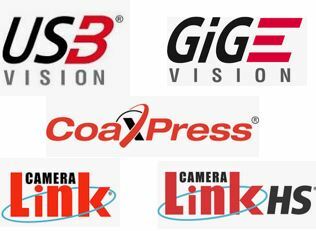 Click here for GigE cameras. 5 GiGe (aka N-base T) & 10GigE similar to USB2 moving to USB3, is the next iteration of the GigEVision standard providing more bandwidth. Both follow the same GigE Vision standards, but now at higher bandwidths. Specific NIC cards will be required to handle the interface. Click here for 5 GigE cameras. The theoretical and practical limits for USB and Ethernet can be quite different and there will always be some difference. For example, large frames and low frame rate generates less interrupts, providing less overhead to the CPU. A small frame with high frame rate generates more interrupts causing more load to the CPU. As a note: This blog post covers the basics of each of the interfaces. There is much more information 1stVision can share with you to be sure you are taking all aspects of the vision application into consideration. We have several additional resources we can share to help, so don’t hesitate to contact us for free consultation! What is offered in a Machine Vision Industrial computer? Previous PostPrevious What are the f-numbers on machine vision lenses? f-stop explained!